Click photos to enlarge, then click again for a better image. Number 6262 This is an engorged female hard tick (family Ixodidae); likely in the genus Dermacentor. You may want to have your dog checked by a veterinarian if it shows any sign of illness during the next couple of weeks. 6221 This was found in my bathtub a couple hours after bathing my son. I almost showered with it. What is it and is it dangerous? I live out on a farm and it was released far from the house. From Proton Station, Ontario. Number 6221 – This is most likely is a funnel weaver (family Agelenidae) in the genus Eratigena; see Click here for an example. These are not dangerous to humans. 6213 Found this guy in my kitchen and handily escorted him outside to play, but am very curious as to what kind of spider it might be and should I have granted him leniency? 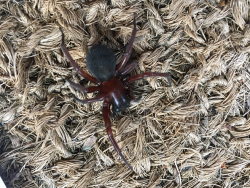 Number 6213 – This is a hacklemesh/lace weaver spider (family Amaurobiidae); like the vast majority of spiders, it has venom glands and thus technically can be considered venomous. However, they are not at all dangerous to humans. This spider appears to be Callobius severus, Click here for more information. This is a very well-fed (and likely gravid) female orb-weaving spider in the genus Araneus, likely A. diadematus, a very common and widespread species in the northern hemisphere. In North America, it usually is called a cross spider whereas in Europe, it usually is called the European garden spider. 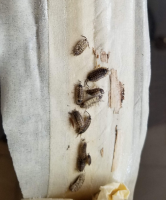 See https://tinyurl.com/mfwo8t2 for more detailed information Ed Saugstad, retired entomologist; Sinks Grove, WV. 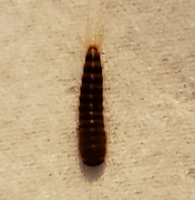 5679 Found on my bathroom floor on May 5th in Stoney Creek, Ontario. 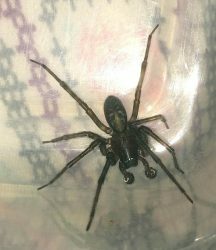 It is the second of two I’ve found and about the size of a looney including its legs. This is a male spider, it looks like a hackle-mesh weaver (family Amaurobiidae). Some Agelenids (funnel weavers) are very similar in appearance, but their spinnerets usually are clearly visible in dorsal view. Ed Saugstad, retired entomologist; Sinks Grove, WV. 5660 From Saltspring Island BC Canada. On May 4 2016. This spider’s body (head to bottom less legs) measures about 2 cm long and 3/4cm wide. Tara. 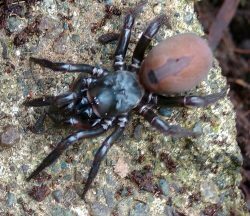 This appears to be another folding-door trapdoor spider in the family Antrodiaetidae; see nos. 5638, 5640, and 5656 for other examples. Ed Saugstad, retired entomologist; Sinks Grove, WV. This spider is in the family Agelenidae (funnel weaver/grass spiders). 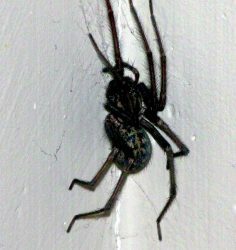 It might be a giant house spider, Eratigena atrica – see http://tinyurl.com/oumh3bf for images and more detailed information. Ed Saugstad, retired entomologist; Sinks Grove, WV. 5654 I thought this was a jumping spider, though it never jumped, but then I was told it was a brown recluse. 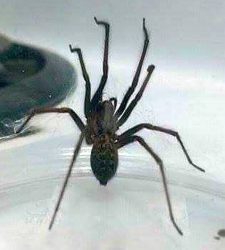 I noticed there are no brown recluses on your site, so it thought if this is one, it might be a good addition to your list. The spider came around the open window every afternoon after I noticed some fruit flies in my dorm room. I finally had it squished, because it was freaking out my roommate, but it was not aggressive. 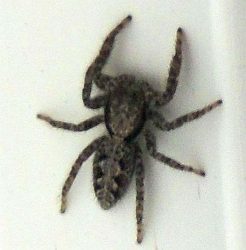 This is a jumping spider (family Salticidae), likely in the genus Platycryptus – see http://tinyurl.com/mm4mxl for an example. These spiders are completely harmless to humans. Just FYI, except for the so-called ‘violin’ on their cephalothorax, recluse spiders lack any readily evident markings. Ed Saugstad, retired entomologist; Sinks Grove, WV. Hello I am looking for help. I have a festering wound and many symptoms similar to the reported symptoms of a hobo spider. 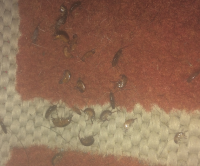 Then a few days after the bite/infection started I found these two guys by my bed. Please tell me if these are hobo spiders. I’m sorry the photos are through plastic, I am not letting them out, ever. One has built a web which it now sits on. 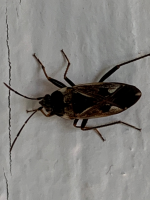 It is the larger and about 3/4 inch long body with hairy brown non-banded legs. I live in an old trailer with no foundation only wood blocks underneath. We had a crazy ant problem so I set out traps and they disappeared. Almost immediately the spiders showed up. Did I bring them out by killing their food supply? I live in the forest near mossy hills backing onto a large park- Sooke mountain regional park, Vancouver Island. 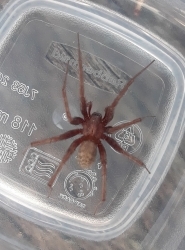 This spider cannot be conclusively identified as to whether or not it is a hobo spider, as this requires the use of at least a hand lens; see http://tinyurl.com/hv45h2h for detailed information. 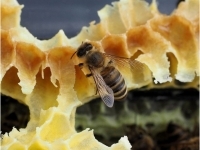 Also, the danger of their bite has been greatly overblown, and there also are causes other than spider bites for the type of lesion you report. Ed Saugstad, retired entomologist; Sinks Grove, WV. 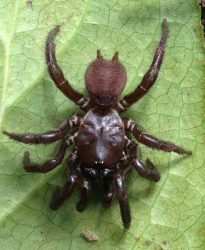 This looks like a female Antrodiaetus pacificus, a folding-door trapdoor spider in the family Antrodiaetidae; see http://tinyurl.com/lp7j62z for an image. Ed Saugstad, retired entomologist; Sinks Grove, WV. 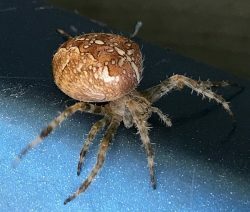 #5629 Hi: please could you tell me what spider this is. Thank you, Emma Griffiths. 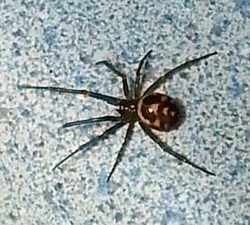 This is Steatoda triangulosa, a comb-footed/cobweb spider (family Theridiidae). 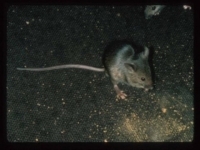 This species feeds on other spiders as well as insects, and is harmless to humans. Ed Saugstad, retired entomologist; Sinks Grove, WV. 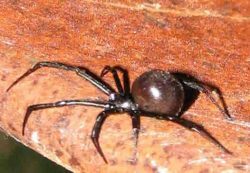 This is a cobweb/comb-footed spider (family Theridiidae) in the genus Steatoda, likely S. borealis; see http://tinyurl.com/hcfxopo for an image. These spiders usually are shy and non-aggressive, but can bite if handled carelessly. Ed Saugstad, retired entomologist; Sinks Grove, WV.